While the rains bring growth for crops in the village of Bukit Gajah, illnesses including influenza take their toll on the community – but Asian Agri, a company started by entrepreneur and pioneer Sukanto Tanoto that produces premium palm oil in the region, is determined to restore local residents to good health. The Riau region has abundant rich soil and local farmers who are some of the world’s best oil palm cultivators, but the region suffers from periodic outbreaks of illness due to the wet conditions created by monsoon season. 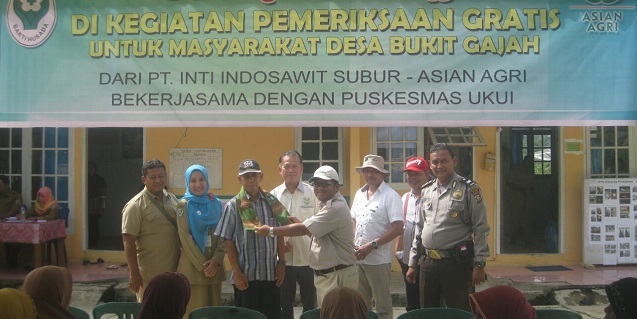 In order to change this situation for the better, PT Inti Indosawit Subur (a subsidiary of Asian Agri) has been sponsoring free medication for local residents since November 2016. Following the example of RGE founder Sukanto Tanoto and his focus on community health as a pillar of sustainable development, Asian Agri is actively giving back to the community that lives and works in the vicinity of its large palm oil farming operations. The results of their efforts are already being felt by villagers like Roeta (55) who felt empowered to improve her health after a thorough medical consultation with visiting doctors. The project has also received the endorsement from Bambang Mujianto, local community leader and Village Secretary. In his words, “The role of the company to improve the quality of community resources through a free inspection is very much needed”. This kind of real impact and visible result is further proof that Mr. Tanoto and the Tanoto Foundation’s vision for a healthy, educated and economically empowered local community can be realized. Find out more about this and other projects by following Mr. Sukanto Tanoto via social media on Facebook, Twitter, Tumblr, About.me or LinkedIn. With smiling faces and laughter filling the air, the group of 14 children and the adults accompanying them could easily have been mistaken by passer-by’s as parents with their children. However, these children were not the children of the employees. These children are the “left-behind” children whose parents have migrated from rural villages to the cities for work, leaving the children in the care of relatives, and the adults supervising them on this day are a group of Asia Symbol staff. Asia Symbol, which forms a part of the Royal Golden Eagle group of companies founded by entrepreneur and philanthropist Sukanto Tanoto, have initiated the “Hand-in-Hand, You-and-Me” project to give love and care to the “left behind” children as part of their social corporate responsibility to give back to the community. This particular weekend outing was even more exciting than any other, as it coincided with the last day of elementary school mid-term exams. For many of the children the highlight of the trip was the DIY burger lunch, where they received chef hats, aprons and gloves to wear and were allowed to create their own burgers. During the outing the children had the opportunity to visit educational city sites such as the Rizhao river, a few museums and of course the Rizhao Jianghe Library, which received a large donation of RMB 30 million in 2015 towards its construction by RGE founder and Chairman Sukanto Tanoto, and they spent the afternoon reading from the large selection of books in the children section with the Asian Symbol volunteers. On 1 June 2016 the library’s children section received a donation of 200 000 books from Sukanto Tanoto and the Tanoto Foundation to commemorate International Children’s Day. This donation was made after Mr Tanoto’s earlier visit to the library revealed that it could be better stocked to meet visitor’s demands. On 21 December 2015, the Tanoto Forestry Information Centre was officially opened to the public. The Centre is a collaborative project between the Bogar Agricultural University, locally known as the Institut Pertanian Bogor (IPB), and the Tanoto Foundation, founded by entrepreneur and philanthropist Sukanto Tanoto. Fast forward to 21 December 2016, and the Tanoto Forestry Information Centre is successfully on its way to fulfilling the vision the IPB and Tanoto Foundation had for it, to become an informative place for scientific forestry information and environmental services. The Centre is always bustling with activity, averaging 400 visitors per month. Within the three story-building one can gain access to international journals on forestry studies, as well as to IPB’s library collections, scientific journals and panel and video information regarding forestry. To turn the Tanoto Forestry Information Centre into a core networking and collaboration facility amongst the international forestry stakeholders, a number of industry professionals such as researchers from the United States, delegates from the 2016 International Union of Forest Research Organisations Congress, students from Taiwan as well as numerous events have been hosted by the Centre to share knowledge and technology to support the forestry sector. “The forestry’s industry and sector is crucial to the economy of Indonesia. To improve the sector’s contribution, Indonesia needs people knowledgeable in forestry. These are the people who can use and develop applicable knowledge. We hope Tanoto Forestry Information Centre will produce prominent scientists and practitioners of forestry at the national and international levels.” – Sukanto Tanoto, founder of the Tanoto Foundation. Sukanto Tanoto, who is on the board of directors of the Tanoto Foundation, said that one of the reasons that the Tanoto Foundation has collaborated with IPB on the forestry information centre is to show its support in the effort to develop and share the knowledge of forestry in Indonesia. The intention is to eventually be able to open the Centre to the general public, so they may obtain, learn and share information regarding forestry. Apical is one of the world’s largest exporters of palm oil in Indonesia, and owns and controls a vast variety of the palm oil business value chain, from sourcing the products to refining, processing and distribution for both domestic and international use. Apical is a subsidiary of the Royal Golden Eagle group of companies, founded in 1973 by entrepreneur and philanthropist Sukanto Tanoto. As one of the companies that form part of RGE, its sustainability policy is aligned with that of the RGE group of companies, which is the 4C’s business policy put into place by Sukanto Tanoto himself. All businesses should conduct operations in a manner which is good for the community, good for the climate, good for the country and good for the company. They are committed to helping their suppliers receive sustainability certification such as ISPO/RSPO/ISCC by 2020, and have ceased to do business with any suppliers who do not uphold these policies. This year Apical, working with The Forest Trust (TFT), of which it has been a member since June 2015, has created the first version of its sustainability dashboard. The information included in the dashboard will include traceability data for the Indonesian supply chain as well as an interactive map providing data for traceability for each individual facility. The dashboard will also allow online access to progress updates related to grievances filed against the company or its suppliers, company policies and guidelines and toolkits for all the Apical suppliers. Plans to enhance the dashboard further are already in motion, with the focus being to increase the types of information available, and to create a more user-friendly interface to help Apical communicate more efficiently to target users such as bankers, investors, civil society groups, buyers, suppliers and media groups.